Calverton, the way it was. • We’re expecting steady rain this morning, and a cloudy afternoon with a few showers. It will be 49 degrees, but the wind will be out of the north at 20 to 30 miles per hour. The National Weather Service puts the chance of rain at 80 percent, with rainfall of only about a quarter inch. We’re expecting sunny skies at 51 degrees tomorrow. No fooling. • Suffolk County will hold a free rabies vaccination clinic at Polish Hall in Riverhead this Saturday, April 5 from 11 a.m. to 3 p.m. The clinic is available to all county residents, but the quantity of vaccinations is limited and available only while supplies last. All dogs must be on leashes and all cats and ferrets must be in carriers. • Tomorrow, April 1, starting at 9 a.m., the East Hampton Trails Preservation Society plans to finish blazing the Deb Foster Path. RSVP to richard.poveromo@me.com if you are able to help and come dressed for painting. • The performance art mavens over at the John Drew Theatre at Guild Hall in East Hampton are planning an April Fools Day extravaganza tomorrow night. Their free performance, which begins at 7: 30 p.m. features Alan Ceppos, Peter Connolly, Chloe Dirksen, Lydia Franco-Hodges, Josh Gladstone, Kate Mueth, Bobby Peterson on piano, and a very special racy performance from Liz Joyce of Goat on a Boat Puppet Theatre. More information is online here. 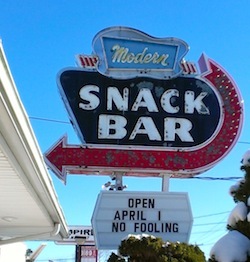 • The Modern Snack Bar in Aquebogue opens for the season tomorrow. No Fooling.